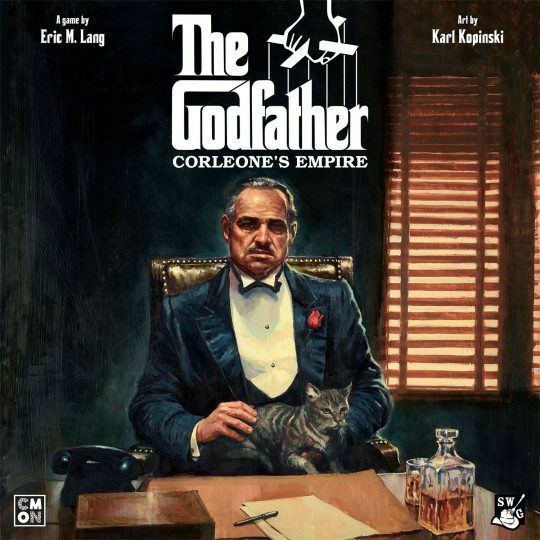 Designer Eric Lang, known for his “dudes on a map” games, describes The Godfather: Corleone’s Empire — a standalone big box board game with high-quality miniatures — as “thugs on a map”. In short, the game is a streamlined, confrontational worker placement game filled with murder and intrigue. You play as competing mafia families who are vying for economic control of the organized crime networks of New York City, deploying your thugs, your don, your wife, and your heir on the board to shake down businesses and engage in area-control turf wars. Money, rackets, contracts, and special advantages (such as the union boss) are represented by cards in your hand, and your hand size is limited, with you choosing which extra cards to pay tribute to the don at the end of each of the five rounds. At the end of the game, though, cash is all that matters, and whoever has the most money wins. The game also features drive-by shootings in which enemy tokens are removed from the board and placed face-down in the river.